Australian small businesses are owed $26 billion at any one time because of unpaid invoices as reported in the SMH in November last year. Research published by Intuit shows that of the 508 small businesses surveyed, the average SME is left in the red to the tune of an average $13,200. As a small business owner you’ve typically been trained in one specific skill set but business and cashflow management is often an area that you need to learn. Unfortunately the learning curve can often present some mistakes that are hard to swallow. For businesses your cashflow is oxygen, it’s critically important you focus on your process to ensure your maintain a positive cashflow and reduce expensive mistakes. Small businesses are estimated to be owned between $10 – 26 billion; of this amount bad debts account for over 60% of this outstanding amount. Small business owners report they spend an average 12 days per year chasing unpaid invoices. 27 per cent of small businesses that don’t insist on upfront payments have been forced to take loans or use credit to pay suppliers and wages. Surveys conducted by The Commonwealth Bank of businesses that have an annual turn over of up to $2 million, show the average debt owed to each business is around $20,000 and rising. Of all the Businesses surveyed, 60% agreed that late payments are “standard practice” and the other 40% are holding on to payments to preserve their own cash flow. Queensland Businesses are shown to be doing marginally worse with a total of 66% of all debts owed falling into the overdue category. A recent report from Dun & Bradstreet (D&B), which shows that 62% of business accounts were settled an average of 53 days or later in December. 60% of businesses that close down are profitable but they simply run out of cash because of poor cash flow management. 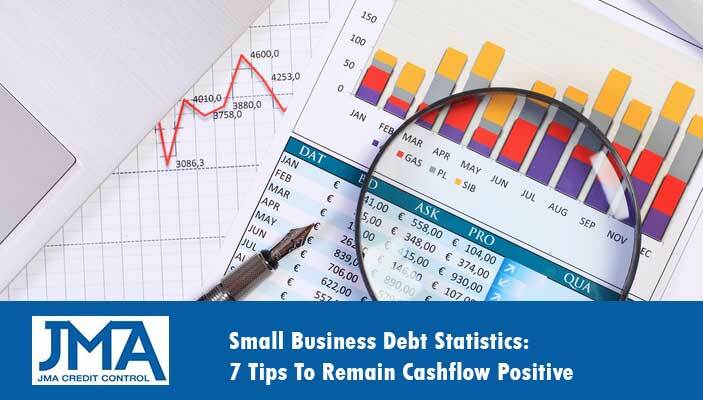 So what can you do to maintain a positive cashflow and avoid becoming one of the statistics? Credit insurance protects your business from financial loss arising from non-payments of accounts receivables. Put simply if you provide products or service on credit (meaning you get paid at a later date) and that customer does not pay, then your credit insurance will reimburse the outstanding debt. When growing your business this type of protection and financial certainty becomes even more important for a number of reasons. Research has shown that only 17% of businesses conduct credit checks on new customers. Before you agree to conduct business with a business or individual a credit check can be used to reduce your risk and allow your business to make informed decisions on potential customers’ or vendors. Credit checks will allow you to make better upfront decisions before any risk has been accepted by your business. Credit checks allow businesses to research customers’ payment habits, access legal records, prequalify new leads and monitor and evaluate new vendors. Credit checks also allow business to lower the risk of acquiring debt collection and recovery costs in the future. By having proper terms and conditions signed and in place before the transaction occurs means that you have an enforceable contract in place should you need to collect money in the future. Included within your terms of trade you can also fees and charges as an expense for the debt should you ever have the requirement to use debt collectors to recover your bad debts. Small businesses often have significant expenses each month such as rent, payment to suppliers and vendors, utility bills and much more. Small businesses often offer shorter payment terms or request some or all of the money up front. Whichever pathway you choose it’s in your best to set the terms in which the full amount is to be paid. Always ensure that any outstanding debts have clear payment terms set and agreed upon before commencing the transaction. For example you might set a 50% deposit with the remainder to be paid in 30 days or at the completion of the engagement (whichever comes first). One of the biggest mistakes your business can make is to operate on your debtors payment terms. It’s your money that is being borrowed so you should always be in control. With current technology it’s even easier to schedule automated payments via credit card allowing you to receive payment within 2 – 3 days. In many cases, customers who fail to pay on time may have simply forgotten the matter. If you don’t hear back from a customer shortly after sending an invoice, follow the matter up with a phone call. The combination of both automatic payments and overdue notifications means that you can keep on top of outstanding debt without your accounting requiring constant attention. Debt outstanding for 6 months or more have a collection rate of 47% or less therefore greatly reducing the chance that you’ll receive payment from the debtor. By implementing all of the steps prior you’ll be in the best position to be armed with the facts, terms and records which will allow you to confidently address any continued customer payment concerns. Once a bill is over 90 days overdue it’s time to get more serious about chasing payments by either issuing a letter through a solicitor or using a debt collection service. By implementing all of the steps prior you’ll be in the best position to be armed with the facts, terms and records which will allow you to confidently address any continued customer payment concerns.